Even though many companies depend on the holidays for a large portion of their annual revenue, a large number leave money on the table simply by failing to plan ahead. Join me as we discuss ways to squeeze more profit from this critical time of year. A bit of planning now can increase revenue, improve your customers' experience and position you for repeat business down the road. Mack McGee: All right. Good afternoon everybody. 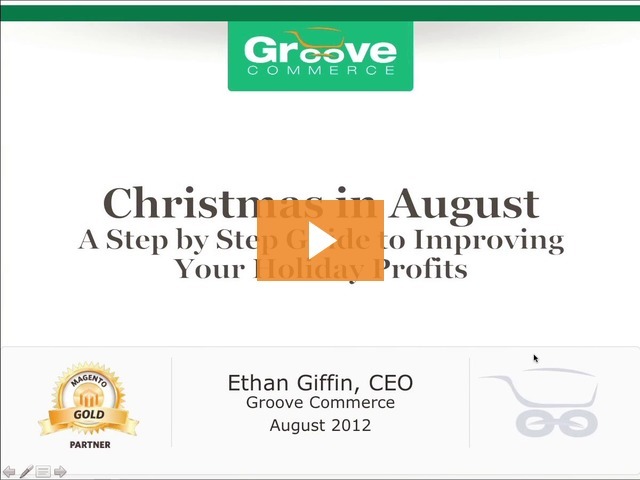 Thanks for joining us for the August edition of the Groove Commerce webinar series. This month’s topic: Christmas in August: A step by step guide to improving your holiday profits. Seems like every year we start prepping for the holiday shopping season online earlier and earlier. So it made sense to definitely roll this webinar out today. Judging by the attendance this is obviously a very pertinent topic to e-tailers out there today. So excited to show you a lot of the content and discussion topics that we’re having with our clients as we prep for what should be a huge holiday shopping season online. So with that, excited to get started. Want to thank everyone for joining us. As always, I am one of your panelists, Mack McGee, VP of Sales & Marketing here at Groove Commerce. And, as always, I want to thank our CEO & Founder, Ethan Giffin, for joining us today in what should be a very interesting topic. Ethan Giffin: Very exciting, Mack. Excited to be here. Mack: So before we get started I want to thank you all for taking time out of your day to be with us. If you are new to the webinar series, real quick, a fly-by view of Groove Commerce. We are an award winning full service agency focused in the ecommerce space providing design and development and customization services around the Magento platform. In addition to that, we provide online marketing services focused on helping you sell more online. And so with that, we’d love to talk to anyone who’s interested further. But today is about prepping for the holiday shopping season. With that, I am going to turn things over to Ethan for what is a jam-packed hour of content. As always, this is an interactive session. Send those questions in. Participate in those polls. We want to hear from you on how we can continue to make this webinar series effective and educational. So with that, Ethan, take it away. Ethan: All right. Thanks, Mack. We’ve got a lot of stuff to cover here today. I’m very excited to talk about one of my favorite topics, and that’s Christmas in August. ‘Tis the season for revenue. This is a very big time of the year for most retailers in terms of peak sales and opportunity to grow sales. Even if you are not in the gift selling business, people are still buying and spending money on things during this time period. So 'Tis the season for revenue. We’ve got about 4 ½ months to go left in the year, so we want to make sure that we do everything that we can to plan. So today we’re going to go over three tips to engage holiday shoppers. What we’re going to go through today is going to be super practical and it’s going to be super straightforward. So the goal of this is for you to walk away with three, four, five, six things that you could go implement on your site that doesn’t take a lot of complex thought. Many of these things are very common sense. And at the end we’re going to have plenty of Q&A time for you to ask questions and get answers back. So again, very excited here today to welcome everyone to our Groove Commerce webinar series. And with that, we’re going to start things out. I’m going to turn it back over to Mack for the first poll question of today. Mack: All right, Ethan. So we want to find out today how confidence is this audience? How prepared do you feel your business is for this holiday season? Some of you out there coming into this webinar, you may have no idea. You may feel like, “You know what? This is my fifth holiday ecommerce season in a row getting ready for things.” Let us know what you think. We’re going to go ahead and let the polls go for a minute and we’re going to see what the results are. Should be interesting to see how people feel here at the beginning versus how people may feel at the end. All right, it looks like we have a statistical majority I guess at least, so we’ll go ahead and take a look at the results here. Ethan, there they are for you. The majority feel they’re OK. Curious to see if that OK feeling stays with them throughout this webinar and how we feel towards the end. I guess we’ll see in the Q&A. And then from there, we’ve definitely got some folks that will openly admit that they’re not sure. So there you go, Ethan. Ethan: With that, let’s dig into the pits. We’ve got a lot to go through today. Tip #1: Plan, plan, plan. Really planning in strategy is the building blocks of executing on a holiday campaign. This is an example of just a simple calendar shot. One of the things that we see is that it’s rare for small to medium e-tailers to really plan enough about their holiday season. As an agency that focuses in the space, we see people coming to us in November, December having us trying to get under the wire to create new email creative and other things, when all of that could have been done in prep much further ahead of time. So really, like take your schedule and break it down by month. You can print out simple calendar sheets in Microsoft Word and you can go out and buy a large whiteboard calendar that has a 6-12 month queue and put it up in your office and really start to put together those building blocks of what an overall holiday season is going to be. What are your themes of the week? When are you going to be posting to social media? When are you going to be swapping out the homepage banners on your site? When are you going to be updating Twitter? What’s your frequency? And then how are you going to take one of the things that we still see, is that people have very weak products in terms of their merchandising. So how are you going to take your top 25 products each month for the next few months and update those with enough information? So it really doesn’t have to be a complex plan. And we’re going to touch on things that you can insert in that plain along the way. But really get out there and map this out now and prep now. You can have 80% of the work done by the time that this kicks in full gear. And instead of running around crazy, you’ll be relaxed and executing, and you’re going to do more revenue than you ever thought in terms of your holiday season. The second tip that we’re going to get into is growing your email list. You want to start now with that. You really should have started six months ago with that, but really thinking about how are you going to engage folks? How are you going to generate more email additions/opt-ins to your list? Because every time you send an email, you have a small percentage of people that are opting out. This is an example of one of our clients, E.C. Kraus. They’re doing a welcome email series where you get 5% off your first order and a free wine recipe book off of your first order over $35 when you join their email list. This is a mobile pop-up. This is actually done by our friends at Listrak, a great product. We’re going to kind of touch on them a couple times along the way here about their engagement and how they engage visitors. But this is a great way of getting people to tee up. I can tell you from looking at the stats on pre-email welcome series, post-email welcome series, the amount of engagement and opt-ins is amazing. I mean it’s like 1,000% more for many folks. So really thinking about how you’re going to start to throw people into the top of the funnel now and collect those email addresses so that you can engage with them later along the way. Here’s another great example of a site that we’ve seen recently. A company called Soccer Loco. They have a welcome series popup that I really loved. For them, instead of giving a discount, they’re actually giving away a free soccer ball with your purchase of $60 or more. You can even select the ball size. So again, you don’t have to give away your margin. You have things within your business that you could give away as part of a larger order that you may even give away if you have retail locations to folks to engage with them in person. So how can you add things into an order to make people happy and to give them a reason to opt in? Because once you have that email address and it’s there, if their persona fits your demographic, you can actively engage them every step of the way. So really thinking about how you are going to get people to engage in an email welcome series, how you’re going to add more opt-ins to your overall list. So with that, let’s get into our second poll question from Mack. Mack: So, as always, it’s helpful for us to kind of gauge the audience. This will cater the content and ability to answer questions for you; we want to add value. What ecommerce platform are you currently on? Let us know if it’s Magento Enterprise, Professional, Community, or another technology. We want to make sure that we’re catering this information as we go to our audience. So go ahead and select your option so we can learn more about who’s with us today. Looks like we got another majority, so go ahead and close this poll out. Ethan, we’ve got a large portion seem to be on Enterprise or Community, followed by a few folks on Professional, and then finally some others. So hopefully that helps as we continue on here. Ethan: Excellent, excellent. And again, these tips and tricks can be used across any site platform where you have the ability to implement. Our third tip is you really want to start increase your social engagement. You do that by increasing your likes and your wants. Our last webinar was all about Google Panda and how Google is starting to really rely on social signals in terms of ranking sites. Instead of using link data, they are really looking at the amount of likes and wants that you have. And they’re really looking at how many times your content is being shared and tweeted, etc. So how you do that is very important. So our third tip is increasing your likes and wants. Example: how can you engage folks with the Facebook Timeline? There’s an opportunity to go out and create your own attributes—things like “I want” or “I own” and get people to imbed those into their timelines. This is very cool because with the new Timeline settings, you can see those; they hang around for a little bit longer than if you just like a static element or an article. It allows people to really signify. How can you get people to engage in your site, again, in terms of products that you want to rank for, in terms of your tail words and product names? How can you get more likes and wants to that? So, example here is adding a like button into your product pages. So whether you want to do that with something custom like “I want” or “I own”, or whether you just want to use the out-of-the-box “like”, you really want to look at that as an opportunity to grow that. So how can you run contests? I know you’ve got to be a little bit careful with Facebook Terms of Service, but running contests that get people to like your page and to, again, drive up those likes, drive up your Google Pluses, etc. Here’s an example of liking for a discount. So, “ Like us on Facebook and tweet or rate us at Google + and get a discount on your next purchase.” Again, a great way to engage folks and to kind of get them to do something for you instead of just giving away the farm. If you look at what you are paying in terms of pay-per-click or other methods of advertising, if you need to give away a coupon or small product, it’s a small price to pay if that can help you, again, build your overall social engagement, which helps your SEO efforts. So, like for a discount. If you are on Magento there’s a couple of great extensions available for that that allow you to kind of give that discount right in the cart. So, a good way to just start pushing it. Tip #4 that we want to get into is gift guides. How are you going to break down gifts for people that are shopping on your site for other folks? Here’s an example from Macy’s. They’ve got a lot of ways to kind of slice and dice their gift opportunities. Is it for her? Is it for him? Is it for kids? Is it for teens? Is it for gifts under $25, $50, or $99? Is it beauty? Is it gift cards? Is it top 10 gifts? So they’ve got a lot of great ways that they were able to kind of put that out in a great holiday theme to drive people to a pre-selected products on your site to make it very easy for people to come in and buy from. Here’s an example from AMCTV.com. Amazing blog content. I think I was doing a search for “holiday gifts for men” and I think this came up on the first or the top of the second page. This was the Mad Men Holiday Gift Guide. And basically, they wrote a great blog post that broke down all of their most popular products that they sell in their store and why you should buy it for fans of Mad Men. Again, they’re taking and making it very easy for someone that says, “If I like Mad Men, if my husband, boyfriend, friend, coworker likes Mad Men, they’ll probably like the things that they’ve picked out on this list.” So it’s a great way to engage people. And for something like this that’s got so much content, it actually helped them in an organic search perspective. So, again, creating these gift guides. You want to show the gift guides by price. Here’s from the site Cool Hunting. They’ve kind of broken it down $25 or under, $26-$100, $101-$250, $251-$500, $501-$1,000, and over $1,000. I’d really like to get a gift over $1,000. I’m not sure how many people are giving those. You don’t want to be super nuts with it. I would typically stick to things like $25, $50, $99, depending upon the price point of your products. If you have more luxury or upscale, higher end products, maybe you’d take that higher end of the $250 or $350 range. But again, you want to put things together that people can quickly buy for someone, have an idea that they’ll like it, and get out the door and move on with their lives. Tip #5: Got Pinterest? People are really trying to figure out how to utilize the site Pinterest and drive traffic and revenue from it. It’s very much in its infancy. We’re starting to kind of see a little bit of an ad ecosystem pop up the way that we’ve seen with things like Twitter and Facebook. But how are you going to engage people on your Pinterest? Here’s an example of a wish list contest: Share your inspiration for your dream kitchen with us and enter to win a $500 Williams Sonoma gift card. So basically, what you do is you basically create your own Pinterest profile, you tell people to follow you, then you can create board with a very specific name—the name of your contest—and then they start pinning their favorite things to that board. By doing that it allows them to enter the contest. The goal is, again, to drive that engagement. Hopefully they are pinning things also to your site that, again, get linked back to you. So as people are repining and taking those things and passing them along that they’re interested in buying, if they click on it, it drives them back to your site. And you’re creating a way to engage folks and get them to work for winning a contest. Here’s an example. It’s not just female related things. We’re starting to see more male engagement on Pinterest. Here’s a necktie contest that was ran where you can win an iPod or a $250 gift card. There’s a lot of ways that you can engage folks here. You could give away products, you could give away gift cards. Make people work for this stuff. Here’s another example from Remington, a spring break contest. Again, they want you to actually repin this image to your boards. So they’re taking a very specific banner image and trying to push it out through the social network with their logo and information on it, and then they’re giving prizes based on that. So there’s a lot of ways you can engage here. You have to look at your demographic. You can very easily come up with some great contests. I know that we have some quick things in the works with many of our marketing clients in terms of how are we engaging them on Pinterest throughout the rest of the year and through the holiday season? So really think about Pinterest. It’s not just about Facebook, it’s not just about Twitter. There’s other things to think about here that can aid you here in terms of links and social media. Tip #6: Winterizing your theme. How are you going to take your site and give it that holiday feel? Here’s an example of Buy.com. It may be difficult to see through the GoToMeeting, but there is some great snowflakes in the background. They’ve got great buying guides that are wrapped with ribbons instead of just standard bars. So they’re doing what they can to kind of drive that holiday theme through the site. They’ve got holiday specials. How are you going to drive people in and make them know that your site is different and that you’re promoting and doing more across the holiday season? Here is an example with Kohl’s. They’ve turned their site red and green and have some great imagery there, basically, again, ribbons, red, green that drives those concepts home and changed their site in terms of overall billboards. So how are you going to engage folks with that? How are you going to kind of brand your site during the holidays? Many folks turn that on Thanksgiving Day and turn that off the day after New Year’s Day. It’s really kind of dependent upon your industry and what your promotions are. But we definitely recommend turning on some type of winter or holiday theme with your site. You want to have very clear timelines with your site, and that kind of brings up tip #7. So we definitely want to keep it simple. “Keep it simple, stupid” is our overlying principle in terms of holiday timelines. These timelines are around shipping deadlines, when it’s the last day to order with standard shipping, when it’s the last day to order with expedited shipping. I would think about potentially offering flat rate shipping at this time of year. People want to be able to quickly put together in their head what the total cost of entry is for a gift. So if they are buying a $25 gift they don’t want to pay $15 shipping. They want to know that maybe that gift has $6, $7 shipping. It’s going to put them at $32, well within what their budget is for buying. You want to have a clear explanation on what the return policy is. How long after ordering can things be returned? What type of receipts, gift receipts if you need it? Think about increasing that timelines so that maybe you run that to the end of January. And then we definitely would start to recommend additional hours for your customer service. So if you are on the east coast and you go home at five o’clock in the evening, you’ve got a whole lot more hours of the west coast people that are buying. So adding additional hours for both your phone and your live chat are very important in terms of this kind of year. Again, you want to do whatever you can to facilitate the buying process. You want to show a clear shipping timeline. Here’s an example from Nordstrom’s where they break down what their deadlines are for standard shipping. To receive it by December 9th, you’ve got to order by November 30th. For Saturday service that you pay for, which is very expensive, you can order by December 3rd. So again, what’s the breakdown? How far in can you go? If you are drop-shipping products it’s a very different process than if you have those in your warehouse. So how do you have all hands on deck to get things out? Time is off the essence for folks. Amazon has really changed the game. You can order products on Amazon Prime and they’ll have it here the next day for $3 or $4. So again, you are competing with a huge, huge machine there and they are changing the standards for shipping and service. So you want to make sure that you can compete as much as you can with that. So showing a clear shipping timetable is very important. Tip #8: Site speed. Again, it affects SEO, affects your conversion rate, affects your AdWords quality score. You want to always be checking your site with Pingdom and YSlow. This is the perfect time of year to go back and check your site speed. We can’t harp on this enough. If you heard me speak before, you’ve heard me talk a lot about it. It affects so many things. So if you can go out and get increased speed on your site. You want to look at monitoring tools. There’s a great tool called New Relic. It gives us a lot of application data about sites, not just the ping. A simple ping of the homepage and a response back yes or no isn’t going to tell you if your site is up. It isn’t going to tell you if your site is running slow. It isn’t going to tell you if you have slow queries. So you really need to start to think about things differently in terms of that monitoring. You want to review your transaction levels, make sure you’re in alignment with the hardware you have. You want to look for 404’s. Many of the folks that are on Magento, we recommend Fooman Speedster. It allows you to do some great stuff with your Java Scripted CSS files and basically speed up sites. We’ve seen, with the right optimization, most times cut in half with that. And if you need additional servers, there are folks where maybe three, four months of the year their transaction levels are very high. So don’t skimp on hardware at this time of year. We’ve seen people come to us that pay a picker/packer in their warehouse more in a month than what they spend on their hosting environment, and that just doesn’t make sense to me. So making sure that you have the right scale, proper environment, making sure that you have enough bandwidth there to kind of have fast performance is very important. So hosting is not an area that you want to skimp on these days, especially when that is basically your storefront to the world. So if you need additional servers for part of the year that’s where you want to tee that up. Tip #9: Email early and often. Again, there’s so much noise going on in terms of what’s happening in the retail space over the holidays. People are blasting emails like I’ve never seen. Last year was probably the most I had ever seen. I started to take a collection of things and do a lot of screenshots of all of the things that we saw come through. We ran our own tests and we were able to send the same email creative multiple times across a 10 day period and just change the subject line and our unsubscribe’s were not abnormal. We generated revenue off of every single email. So it doesn’t have to be complex or complicated. You need a lot of repetition at different days, at different times of the day. Don’t forget about the weekends. During the peak holiday season, kind of a smaller, mid-tier retailer, we always recommend emailing probably once a week during the year. But in terms of your peak season, you could probably get away with two, to three, to four times a week, depending upon the size of your list and still generate revenue every time an email goes out. So, again, there’s so much noise these days. People have iPads, iPhone’s, Apple TV’s. People are surfing the web constantly. People are watching TV. You really have to think about what is all of this noise and how you are going to put yourself in there. Again, sending those emails in a repetitive nature very, very important in terms of that engagement. Here’s a couple examples of Solstice, and here’s Staples. Again, make those emails have holiday themes. I would mix it up between just general promotions and then products and put as much out there as you can between Thanksgiving and New Year’s Eve. Tip #10: Don’t forget to merchandise. A lot of people are not offering physical gift cards these days—something that you really want to look at. Physical gift cards allow people to send it to a person. They have something to open and then they can use it as much as possible. Don’t forget to promote gift cards on your site. Again, gift cards make it easy for someone to give a gift for a store that they like, and then they can get what they want. A lot of these gift cards go unused, which can be a benefit for an e-tailer. So again, offering physical gift cards and driving traffic to your gift card page is very important. A simple trick to look at with gift cards is something like your site search. You may have the ability to put synonyms. So you might want to have gift cards/gift certificates equal the same thing, because people are going to look at that differently. Next you want to use bundles to create gift sets. In Magento you have the ability to create bundles. You could put two or three things together that may equal $50. You can increase your average order value when you put three great things together that people enjoy, and it allows you to kind of have unique things that may not be affected by MAP pricing. So again, creating those bundles to create gift sets and then driving traffic to those gift sets through your gift guides, very, very helpful. Tip #11: Pretty paper, pretty ribbons. My friend Willie likes to sing about pretty paper and you shouldn’t forget about it either. So, “Blue Eyes Crying in the Rain”. So definitely offer gift-wrapping and gift messaging on your site. A great way to, again, dress things up a little bit. I recently made an order from the site MrPorter.com, which is a great menswear site. So make it memorable when people get the gift. A lot of times, people just shove something in a cardboard box with no branding and use some bad looking tape and send it out through UPS and FedEx. Take a little time to think about how your products are being branded, how your boxes are branded, how you are sending things out, what kind of card you’re putting in with this. I know some e-tailers that put handwritten cards in with every order, and they’ve developed mechanisms within their business so the picker/packers have certain scripts and can sign these cards. Make people feel wanted. I thought this was pretty awesome when I opened up the box. First off, when I opened the brown cardboard box, this gift was wrapped in tissue paper, black and white tissue paper. Then I opened that tissue paper and I see a very nice branded Mr. Porter box. And then when I opened that box, it was addressed to me, Mr. Giffin. I thought that it made this package memorable, made an item look much more upscale, and made me feel great about buying from them. So that would make people feel great about buying from you. So make this memorable and include some things in that box when you are shipping out. Tip #12: Don’t let them walk away. This is an example of a cart abandonment email. Thinking about your cart abandonment process. Again, it’s a great product by Listrak. You can email people five hours, eight hours, 24 hours, 48 hours after they have left your site and left things in their cart. It’s a great way to drive revenue that you may have lost. People get busy throughout the day. Their phone rings, etc, etc, and then you have an ability to go out and create some staggered offers with that. For cart abandonment, again, don’t give away the farm. Make the first email be a reminder, the second email be a small offer, and the third email be a large offer. People have done tests and they’ve done cart abandonment emails that are 30, 60, 90, 120 days out with things in their cart and still generated revenue from those emails. Not huge amounts of revenue, but the cost to send those emails is relatively low once the campaign is set up. So how are you going to make sure that you’re grabbing people in the noisy world with that? Another way to do this is product retargeting. Here’s an example of BackCountry.com. I was looking at a DC Ceptor snowboard boot, and I was also looking at Burton snowboard boots. Surfed around on the site, looked at a few products, and then I went to NBCNews.com. There was a banner ad that was very much catered to the things that I was looking at when I visited their site. So most people don’t have the perception or have the knowledge that they are being retargeted to. They’ll be like, “Oh, wow. That’s so neat. How does it know what I like?” Again, you have the ability to drive back very targeted traffic to your site and to get them to purchase. Typically, retargeted is not hugely expensive depending upon the amount of traffic that you have. You do need a minimum amount of traffic for it to be successful. But I definitely would not forget about retargeting in terms of a strategy in terms of your holiday market. Tip #13: Bottle up. Post-purchase follow-up, very, very important. Most people skip out on this opportunity. They just send a box out and that’s it. That’s the last that you hear about it. So make sure that you are sending a review email out to folks 23-30 days post-shipping to ask people to come back and give a review. If they don’t do that, I would actually send a follow-up after that and maybe entice them with something. These reviews make awesome user generated content. It’s a Panda killer, right? How are you differentiating yourself? Well, you get enough reviews there, then you are generating a lot of content. Don’t use something like Power Reviews Express, Java Script based. You are not going to get the SEO value of that. And then, the one thing that we’ve seen through a lot of research is that visitors expect between 3-7 reviews on a page per product to really make sure and feel confident about their purchase. Again, one of the amazing things that Amazon has—tons of reviews on most of the products. You have the ability to go through and read them. Not all of the reviews are great for every product. As we all know, there are some jerks out there that are never happy with anything. But I think people do like to see a cross section of, “Hey, I absolutely love this”, maybe a more mild tempered review, and maybe one or two that were not happy. A lot of people aren’t utilizing these emails to have cross-sell of other items and related products. So think about how you are following up post-purchase with folks and triggering out emails to them. Especially if you have consumable products that you sell, this is very, very important, and again can drive revenue once it’s set up and running in automated fashion. If you are not going to work on getting reviews on your site, I definitely wouldn’t have them, because having them with no reviews is very challenging. So this is something you need to work at, you need to put some effort into. And if you do, it’ll definitely work well. So that post-purchase follow-up, again, something that most people forget about. We’re kind of talking about next steps here. We definitely want to set a holiday schedule. Go print out the calendar for the next few months. Lock in what you are going to do. You want to take away three or four items from this presentation. We’re going to be sending it out. As always, we record this presentation. We put it online. We’ll also be sending out the slides and other information. We’re also assembling this into an e-book in terms of our 'Tis the Season e-book. You’ll get that as well for taking part in this webinar. So take away three or four items from this and go out and execute. That’s the biggest thing. Execution is the key to driving more revenue. So we want to help you make more revenue that you can actually hire Groove with said revenue to help you with….just kidding. But seriously, our goal with these webinars is to put out very actionable items that you can go out and utilize to generate more revenue on your site. None of this was complex or complicated. It’s thinking about the little things. I often say it’s the 20% that most people forget about. With that we are going to have our third poll question of the day. So I’ll turn it back over to Mack for a second. Mack: All right, Ethan. Awesome content. Get some water because the Q&A session is going to be packed from the looks of it. So, real quick, quick poll. We always want to ask for permission. If you’d like us to contact you about how we can help you improve your holiday plans for your company, let us know in this poll. Nice easy pitch as Ethan just said. Obviously happy to help and are providing a lot of value to companies in getting ready for their holiday planning. With that, we’ll go ahead and close that poll and start to get into the Q&A. Ethan, lot of questions coming in. So we really want to start to tackle some of these. Folks, as always, keep the questions coming. If you like we’ll sit on here and answer these questions as best as we can and as quickly as we can. Before we get into the Q&A, want to remind you about our next webinar coming up in September. You can register now at GrooveCommerce.com. The topic is inbound marketing: defining your online strategy to generate more business. This should be an awesome webinar. We’ve done some exciting stuff recently in terms of our own inbound marketing. So we’re really excited to roll this one out in September for you. This will be useful to people that sell products online, don’t sell products online; just trying to really increase the footprint of your online presence. With that, go ahead and feel free to register for that now online. With that, let’s jump into the Q&A. Ethan, the first question somebody wanted to ask is when should they implement this holiday theme? You talked about winterizing the site. When’s a good time to roll that out? Ethan: I really think that’s something you can kinda make your own judgment call with. Typically we’d say sometime Thanksgiving-ish, mid to late November, and then keep it until probably just after the New Year. A lot of people will kind of give up between Christmas and New Year’s, but people get a lot of money and things spent during that timeframe. So I would kind of keep it going. You may even keep it till the 15th of January. But that’s up to you. If it’s more kind of benign and snowflake based, you could actually keep that through February. If it is more red and green you probably want to finish that up close just after New Year’s. You don’t want to be like my grandmother who loved to keep her Christmas tree up until April and put Easter bunnies on it. You want to make sure that you are staying legitimate with your site. So I would say that there’s no set thing there. I would look at how much traffic you generate. But like, for instance, in Magento you can actually set the them up and you can schedule it to automatically turn on and turn off in Magento Enterprise, so that’s how we typically handle it with folks. I would say somewhere around Thanksgiving and probably somewhere between the day after New Year’s Day and January 15th. Mack: OK, great. So Ethan, the next question came in. I need to make sure that I read this correctly. People want to know, obviously with the holiday shopping season you are marketing not just to your typical end user shopper that’s interested in your products but people that are gifting. How do you approach that from a marketing standpoint and even like you talked about, the post purchase product follow up? You know, mom’s on the site buying a gift for the son or dad’s on buying for the daughter, how do you kinda handle this situation? Ethan: I would say that’s a different persona that’s engaging in your site. So they’re not going to take the normal paths to find products that you have. They’re not going to spend a lot of time researching things and kind of comparing and doing things unless it’s for someone very special or unless it’s maybe a diamond or something like that. So again, the gift guides are a great way to make it very less abrasive to come in and say, “I want to buy something for someone that likes X thing, and I want to buy them a gift that’s $50. I’m willing to spend up to $59 between shipping and the gift.” And then they can go in and they can quickly buy it, and then bam, out and they’re done. You really want to look at some of those bundles like I discussed too. Maybe you have some really cool items that you have like three $15 items that go well together. That becomes a $45 bundle if you put them together. With shipping they might be at $52, $54, $55. Again, make sure that you are looking at things a little bit differently, making sure that you’re putting things together that people may like. I bought some socks online recently. I think they were $8 or $9 a pair. If they would have had a bundle with three pairs where I could choose where I wanted for X amount, maybe I got 50-cents or a buck off, that would have been a much higher average order value that it would have if I just bought one $9 pair of socks. So again, the ability to make it easy for people to know what to buy, what’s good for a guy, what’s good for a girl, and what’s good for someone that’s teenage or older, and then by price range. It’s not real hard to go in and create two or three sentences of content around each product and feature four, five, six products in each bucket for those visitors. You could create something like that in two or three days. You have the kind of Macy’s example where they had a ton of creative and stuff, but you also have the AMC blog example where they had a small banner and the blog with a bunch of text and links. Somebody like that could put that together very quickly. So just make sure you make it easy for people that want to buy for others to know and see something that is easy to buy. Mack: The next question comes from an e-tailer. They’re saying that maybe their products aren’t necessarily gifts, but they’re wondering can they still take advantage of this holiday theme, mood, end of the year? Any advice around that? Ethan: I think that any way that you can change your site up, it shows your repeat visitors that things are changing. When you go to the store, they’re constantly moving around the displays. And most e-tailers don’t move around what they’re doing. Every two to three years they might redesign, and maybe we may even see folks that might change their banners every six months. I think that even if you are selling widgets, if you are selling whiteboards, you could still make your site have a winter or holiday type theme. Kinda come up with something along those lines. People are buying for all sorts of things in that time period. They’re having parties in their homes. They’re getting things for the office. They’re blowing out their end of year budgets in terms of taxes and other things if they’re a business. So there’s other opportunities to engage with people that are just spending money in that fourth quarter of the year. Ethan: I don’t know. I mean I would definitely…that’s a challenging thing. I don’t know that I would go crazy. Many e-tailers lock their site in at Halloween and kind of keep it through January. I would say that if you have a lot of traffic there may be some opportunities there, but I would really think carefully about what you are doing. I wouldn’t test major changes to the navigation. I would just really kind of think about things that you were doing there and just make sure they are well thought out and planned. So everything, every site and every kind of audience is a little bit different. But I would just make sure that whatever it is you’re going to do that it’s well thought and planned. Amazon is always testing things. That’s why you can’t copy what they’re doing. They find out that things work much faster than…they’re testing bad things at a rate that they figure out much faster than a normal e-tailer even has enough traffic to determine. So even if you are getting a couple hundred thousand visits a month, those are still low numbers to test in. So I would just be careful with it whatever it is you’re doing. Mack: OK, so staying on that same theme, got another question. This e-tailer talks about, again, increased traffic, anything to prep from a hosting standpoint? So you’ve got optimal site performance, you’re doing the email, you’ve got the site, obviously people hitting for holiday traffic, obviously increased activity. Anything to do to be prepared for that up front? Ethan: I would say that really think about what you’re doing from a hosting standpoint. I’m not lying when I said that if you are paying a picker/packer more in a month than you are spending on hosting, you are probably doing something wrong. I got an email this morning from an e-tailer that’s running multiple sites of Magento on a single server with decent traffic. If you are doing that, then you probably want to think about having a web server and a database server. If you are kind of peaking that out, then you want to think about having two web servers and a database server. Then the next step from that is maybe two web servers and two database servers. Most people really kind of under host. They are used to the Godaddy mentality of $10, $20, $50, $99 a month. And if you are getting real traffic and you are doing $10, $15, $20, $30 million in revenue through your site, if your site goes down, what’s the cost to bring that back up? What’s the opportunity cost per hour lost from that outage? You really just need to plan accordingly there. If you need to bring in another server for just the fourth quarter, that’s something to think about. You want to work with your host provider on that. And most of them are typically kind of amiable to those situations if you are a good customer. So just really making sure that you have the right host, making sure that you are not going super cheap on that. You really want to evaluate that. Mack: OK, great. Next question, a merchandising question: Should you always have the same banner on your main website as your mobile site? Ethan: The answer is it depends upon how your mobile site operates. There’s lots of different ways of doing mobile these days. You want to try to maintain as much as you can. We’re seeing mobile transactions increase. We’re seeing a lot of tablet transactions increase. You want to think about how you are handling those. I would say that you want to try to match your mobile site to your main site as much as possible. I would say that you don’t have every promotional opportunity with your mobile site as you do with your…you don’t have as much kind of real estate there. Is your mobile site trying to drive folks to a brick and mortar location? You’re going to handle that differently than if you are straight ecommerce. You want to try to make those match. You don’t have as much real estate and you don’t want to overcrowd things within that site. I would try to make it work as best as you can. But also, don’t make it hard for people to view your site. Mack: Next question. Obviously Forrester and Internet Retailer are showing that not only are people buying more gifts online now, they’re buying more for themselves during the gift giving season online. Anything you think, Ethan, that people can do to take advantage of not only—I’m sure you may have done this once or twice when you are gift giving for other people, you might have picked up one or two things for yourself. Ethan: I think that there’s some great opportunities there. If you’re buying from a site that you actually like yourself, it’s always cool to kind of get that extra gift card in the box that you can use yourself. You buy $100 get a free $20 gift card. Those are opportunities to kind of do that. It’s a really easy way to get folks engaged, get them to come back and spend more money. You are giving money away, but at the same time they’ve got to come back and spend it at your store to use it. I would really think about that. That could be challenging but, as well, people are buying for themselves. So any way you can kind of make a promotion around that I think it’s great. Mack: The next question is: How do I turn my social media channel into a revenue driving tool during the holiday season instead of just an extension of my brand? Ethan: I would really think about how you are featuring promotions within a site. I think that I would look at running some contests. I would try to increase the likes. In terms of Facebook, you’ve got promoted posts which are very cool. So for $10, $20, $30 you are able to promote that post and get it out to all or most of your likes versus a small percentage of that. We’re doing some experiments with that and kind of seeing what the results are there. It’s kind of a little bit mixed, I’ll be honest. But for the price you may want to try it. I would try to look at if you have 65,000 people on your email list and 2,500 people liking your Facebook page, I would really think about how to do some very specific campaigning now to engage those people in. And the same things in terms of there’s some great tools out there where you can take your email list, import it in, and see how many of those folks are on Twitter. Then I would want to say, “How many of those folks have more than 100 followers on Twitter?” That’s the ability to create some real interesting social opportunities there. Most people, their social channels have very, very low engagement because they have low subscriber counts there based upon what is actually in their email list. So you want to work to kind of cultivate that and get that out. From there you can run some great contests and specials. You know, give away prizes every week, get people to like things, get people to share things. In the process you are helping your SEO. That’s how you kinda turn that into a sales channel. You are previewing the products, putting flash sales up on line. But you gotta have kind of a base follower count or a like count to be able to do that. Mack: OK, great. Ethan, you talked product reviews. Are the Magento reviews, that Magento review module that is the phrase “out-of-the-box” with Magento Enterprise enough or do people need to invest in the next level? Ethan: I think that for most folks it’s enough. I think there’s some great extensions out there, but I would say that when you pair that with a post-purchase follow up package with someone like a Listrak where they are automatically sucking all of your email addresses out of Magento and into their system and automatically triggering emails based upon when orders are shipped or purchased. I think that becomes a very strong combination and I don’t see a reason to go a different direction with that. AheadWorks has a great review module that kind of adds some additional features and functionality. I typically want to keep it simple unless you are selling electronics or high-end stuff. You really just may want to have one star attribute and a comment. I would drive some contests around reviews to get more reviews. But again, the out-of-the-box works. The only component it doesn’t have is that post-purchase follow up. Once you add that in there you can do some great stuff with it. Mack: OK, great. Final questions coming in here. Are there any statistics or thoughts around winterizing versus not winterizing? It sounds like we may have a little bit of some skepticism out there as to how effective that can be. Ethan: I can’t tell you that you are going to drive specific revenues up with that winterization. But what I am telling you is that when you go into Macy’s or Nordstrom’s, they’re changing windows seasonally. They’re changing the displays weekly in terms of what they are displaying, what products they are highlighting. When you go to the grocery store they are changing the things that they put out at the front door and that they focus on based upon the time of year. So most e-tailers don’t do that kind of thing. I would say that any opportunity you have to kind of seasonalize a site…and for most folks, if you do it the right way you are basically changing the CSS file. You are creating some design aspects, but then you can implement like a new background and other things. It doesn’t have to be crazy. There are folks that do really cool winterizations, but there are also people that just add snowflakes to their background or add snowflakes or snow to their logo. Those are the things, those little kind of touches make it cool. Mack: Final question, Ethan. This person wants to know: So obviously a lot of different channels you can communicate to your audience through during this time of year. It’s a huge revenue driver. How do you balance that? Obviously you want to communicate as much as possible to drive revenue, but you don’t want to bother people, so to speak. Is there any recommendation around the proverbial sweet spot of the amount of communication? Ethan: We often hear about bothering people. I will tell you, you just need to kinda throw up on them a little bit. There are people that hang out at Facebook, there are people that hang out at Google +, there are people that hang out on Twitter, there are people that read emails, there are people that don’t read emails. I think in this day and age there is such an ADD factor going on in the world that you almost have to slap people with what you are doing or else they will forget about you. You want to make sure that your opt-out rates aren’t crazy. But you want to do everything within your power to get in front of these folks. You will be surprised that if you come up with a consistent and well planned out outbound social and email strategy that people will spend money on everything that you put out there if it’s quality and you have quality offers and reasons for them to engage with you. I don’t think that you can have enough, again, based upon the size of your overall list. If you have 1,000 people on your email list you are not going to get a lot of traction. But if you have 100,000 and you are sending out to folks that are in Gmail and other things, they are missing those emails; they’re not going to see them, because that’s why Nordstrom’s, Staples, Dicks Sporting Goods are pounding folks across the holiday season there. From before Black Friday through the end of the year they’re out there pounding their emails. I would really think about…there’s a lot that you have to do to bother folks if you are putting quality stuff out there with good offers. So really think about that. Think about if you are not asking for the sale during this time of the year, you are probably not going to get it. Mack: OK, great. With that, thank you, Ethan. Awesome content today. Very attentive crowd. Thank you everyone for the Q&A. Obviously a very interesting topic. A lot of people really starting to turn their focus and head towards this as we head down toward the final part of the year. So Ethan, thanks as always for the great slide deck and great information. And, as you said, we’ll make this available to everyone. Ethan: Thank you very much everybody for hanging out today. I know it’s a busy time of year. And don’t forget next month’s webinar as well on Thursday, September 20th in terms of inbound marketing. We’re doing some cool stuff with some new products like HubSpot and other folks that we’re going to be talking about. If you have any follow-up questions, feel free to tweet them to @GrooveCommerce on Twitter or follow up via email to info@groovecommerce.com. Thanks again everybody. For the webinar, go to GrooveCommerce.com/webinar to register for September’s Groove Commerce webinar. Thanks a lot everyone.